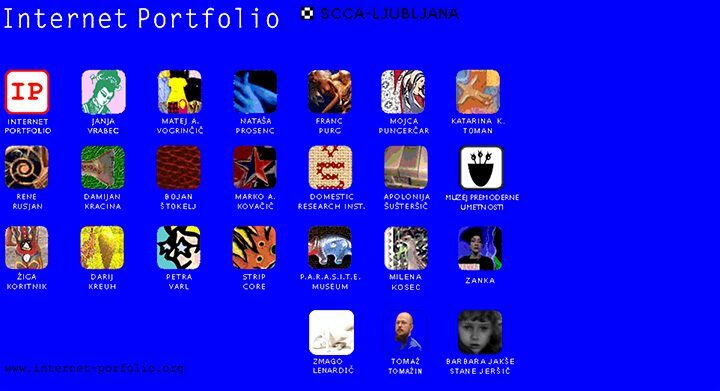 In the framework of its programme and in co-operation with Ljudmila (Ljubljana Digital Media Lab), SCCA-Ljubljana has conceived the Internet Portfolio project in 1997. The project engages individual artists into the use of the Internet as both, a tool and a potential means of expression and facilitates them to prepare in co-operation with the experts their Artists Profiles on the World Wide Web. The process of work comprises the basic instruction of the artists in the new medium, conceptual design of the Profile, elaboration of the scenario, realisation, and further supplementation and updating of the web site. Internet Portfolio is not focused on net.art. Nevertheless, the individual projects have been so inventive and diverse in their approach that they escaped by far the repackaging routine of conventional presentations of different institutions and individuals on the Internet. At the same time they represent a valuable database and excellent promotional material that is easy accessible to international professionals and users, thus (also copied and distributed on CD-ROM) initiating and encouraging international (co-)operation. ZANK (Zemira Alajbegović in Neven Korda). Britannica.com – web encyclopaedia have rated the individual Internet Portfolio projects with high grades. Internet Portfolio has been presented in Slovenia and abroad, on international exhibitions, festivals and conferences, as well as individually to the SCCA-Ljubljana guests.